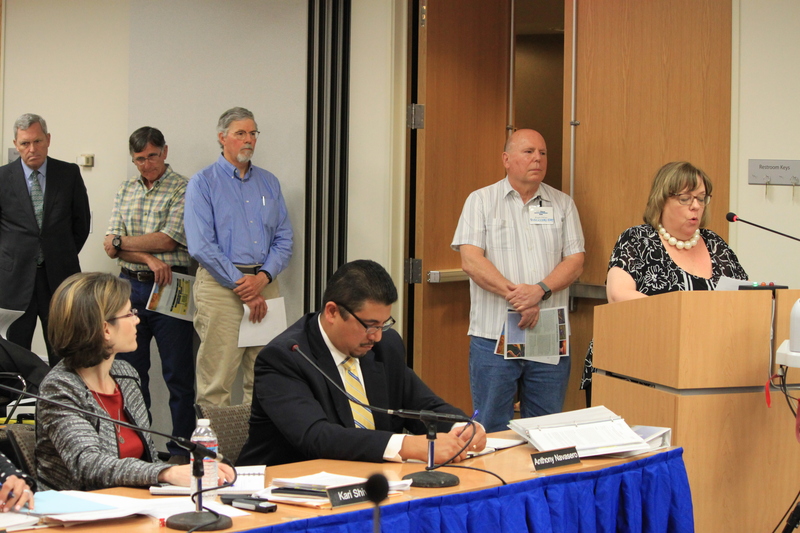 It was a standing-room only crowd that packed two rooms at the April meeting of the Delta Stewardship Council, as Delta advocates gathered to voice their opposition to the California Water Fix project, and so by extension, the Council’s proposed amendment to the Delta Plan regarding conveyance, storage, and operation. 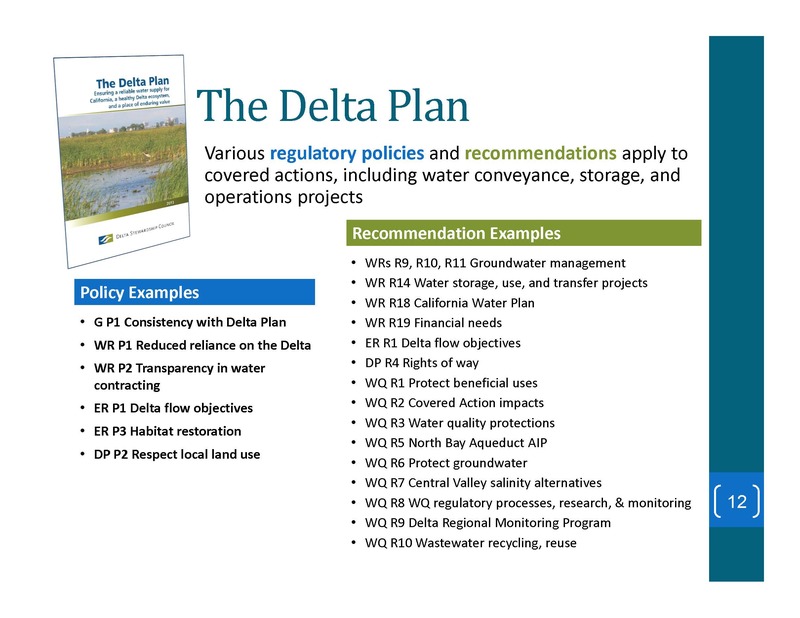 Last week, a revised discussion draft was released which follows the format of the original Delta Plan with narrative, problem statements, and recommendations. “Our hope is that you find the draft responsive to your feedback and to public comment, and where it is not, we can have more dialog today, dig into the language itself, then hear more comment,” she said. Anthony Navasero, Senior Engineer with the Delta Stewardship Council, then gave a brief presentation on the background of the issues discussed in the problem statements of the draft. Historically, the Delta is the largest estuary on the West Coast. The pre-development Delta was a complex system of dendritic streams and channels. It is estimated that over 40% of the state’s runoff flowed through the Delta. 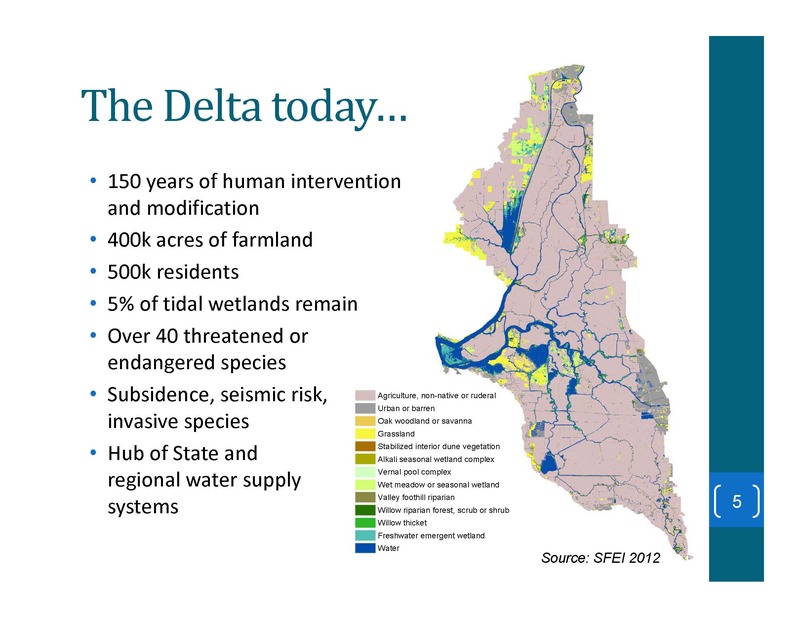 The San Francisco Estuary Institute has estimated that over 70% of the Delta was an emergent freshwater wetland and another 10% of other types of wetlands. 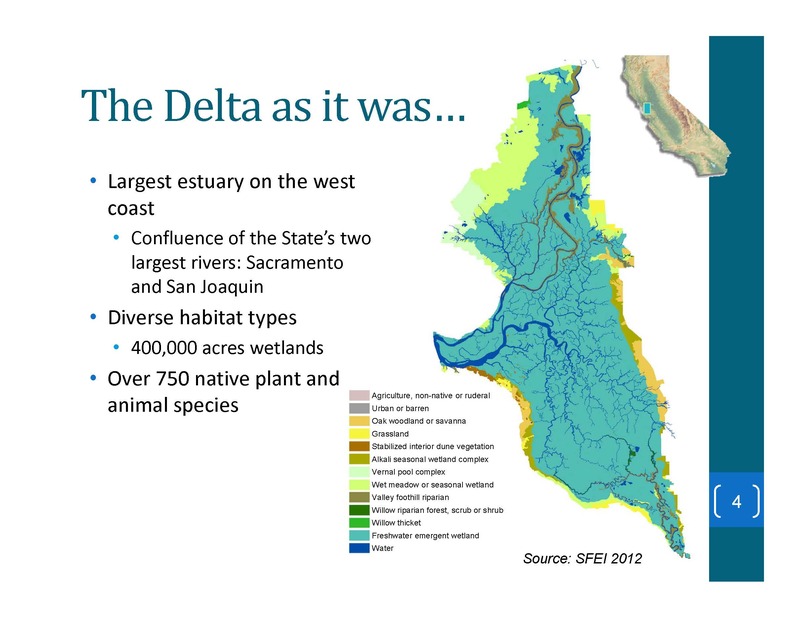 The Delta was almost 50 to 100% wetted, which supported a diverse ecology with over 750 plant and animal species. Less than a couple of hundred people were estimated to live in the Delta at the time. 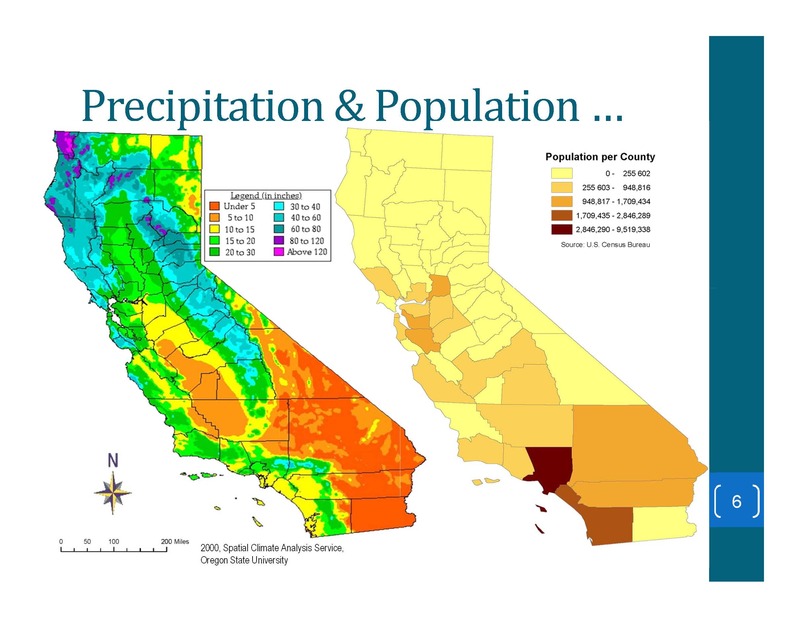 Most of California’s precipitation falls in the north, but for various reasons, two-thirds of the state’s population is located along the coast in the south, he said. 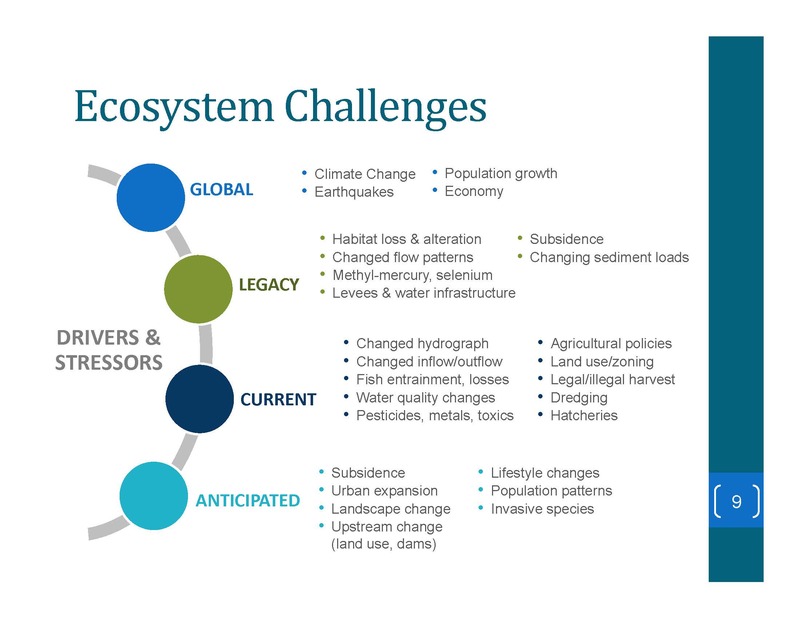 This geographic imbalance between where water is available and where water demand is high, as well as the fact that precipitation’s highly variable and unevenly distributed are at the crux of the issues with today’s water system. To move water from where it is in the state to where the demand is, several storage and conveyance systems were developed. Early on, the state depended first upon surface water, and then as development expanded further away from surface water supplies, tapped into groundwater from local aquifers. But as the state population grew, larger facilities and infrastructure were needed for the growth of the state. First, Hetch Hetchy reservoir system, a multi-pipeline system, was built to supply the City of San Francisco. 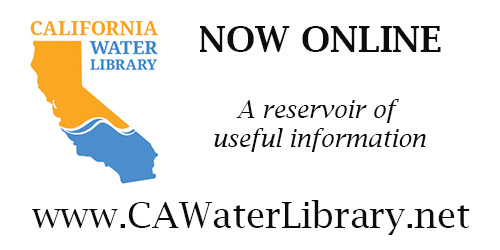 Not to be outdone, the Pardee Reservoir and the Mokelumne Aqueduct, another multi-pipeline system which is mostly above ground and over the Delta, was built to serve residents in the East Bay of the San Francisco Bay Area. The Central Valley Project and the State Water Project systems of reservoirs and aqueducts deliver and transfer water through the Delta. 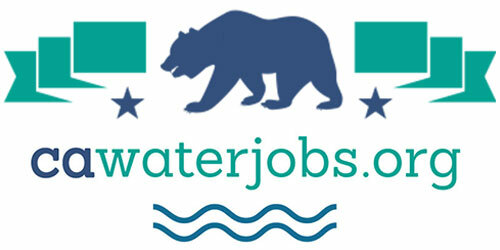 Other storage and conveyance systems have been in and around the Delta, such as the Contra Costa’s Los Vaqueros Reservoir and the North Bay Aqueduct. 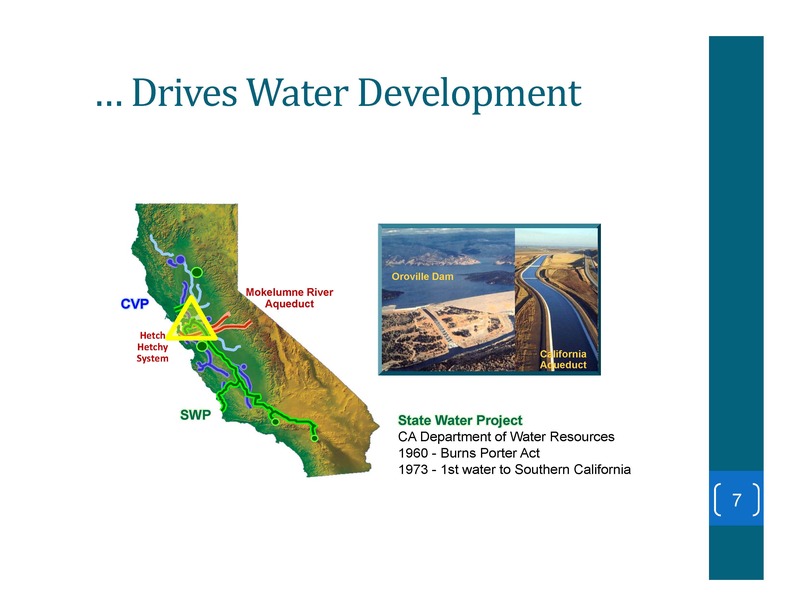 All of these projects combine conveyance and storage and are centered in the Delta, the hub to most of California’s water supply interests. 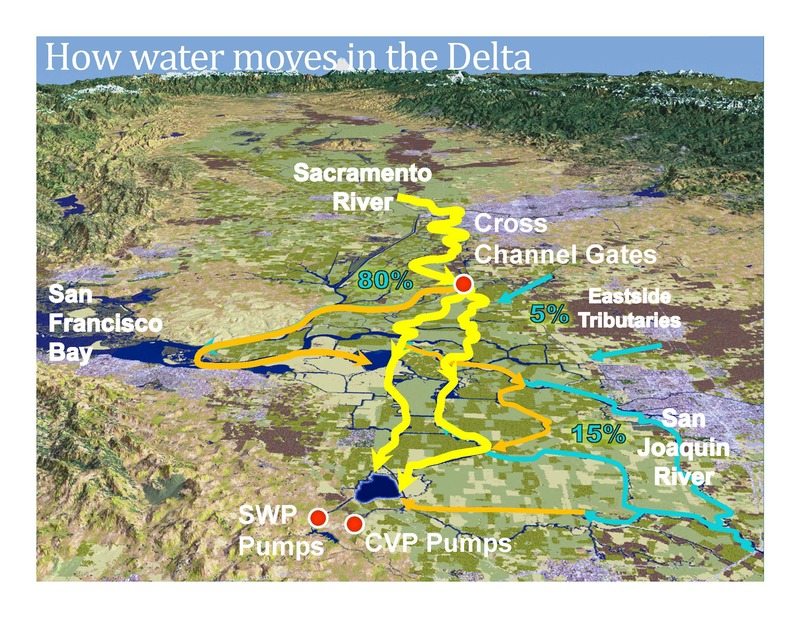 Rain and snowmelt from the Northern California mountains flows into the Delta; on average, about 80% of the Delta flow is from the Sacramento River, about 15% is from the San Joaquin River, and approximately 5% from the east side tributaries such as the Mokelumne and the Cosumnes Rivers. Historically Delta flows moved from the north- and south-westerly into the center of the Delta and then out to the San Francisco Bay. 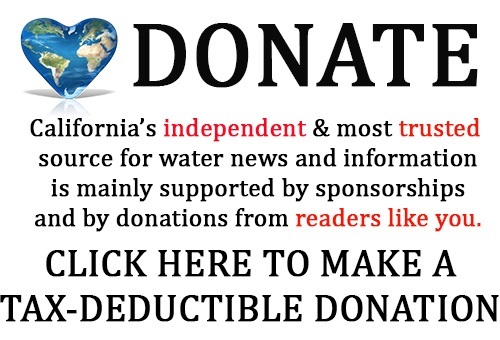 Additionally, flows and reservoir releases from the Delta watershed limits salt water intrusion and managed tidal influences from the San Francisco Bay. From the 40s on, infrastructure was built to manage the water system in the Delta, but have significantly affected flows. In the early 50s, the Cross Channel infrastructure was built to deliver fresh water to the east and south Delta. 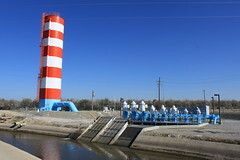 Large pumping plants from the state and federal projects in the south Delta draw large amounts of water via the Old and Middle Rivers and pump it out of the Delta. This pumping action reverses natural flows backwards towards pumping facilities and pulls water across the Delta. Native fish move with these reverse flows, which can place them in less favorable areas for habitat foraging as well endanger of entrainment and predation. Reverse flows can also draw saltier water from the Bay into the Central and South Delta. Additionally, in-Delta users depend on fresh water supplies. These conditions are especially problematic in dry periods in droughts. With the Delta managed as a freshwater system year round, it is a constant balance between fresh and salt water. All of this is happening in an estuary that is home to 750 types of plants and animal species. Currently, all proposals ­must show consistency with the existing covered actions; the amendment would add new recommendations to the existing policies and recommendations. 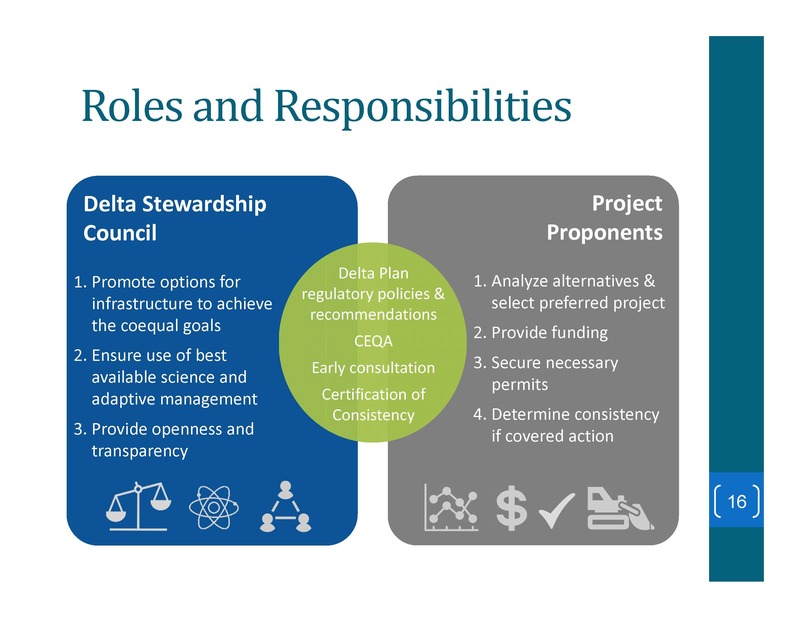 “These recommendations are recommendations to help guide applicants, but they would not control a projects consistency with the Delta Plan,” Ms. Enos-Nobriga said. 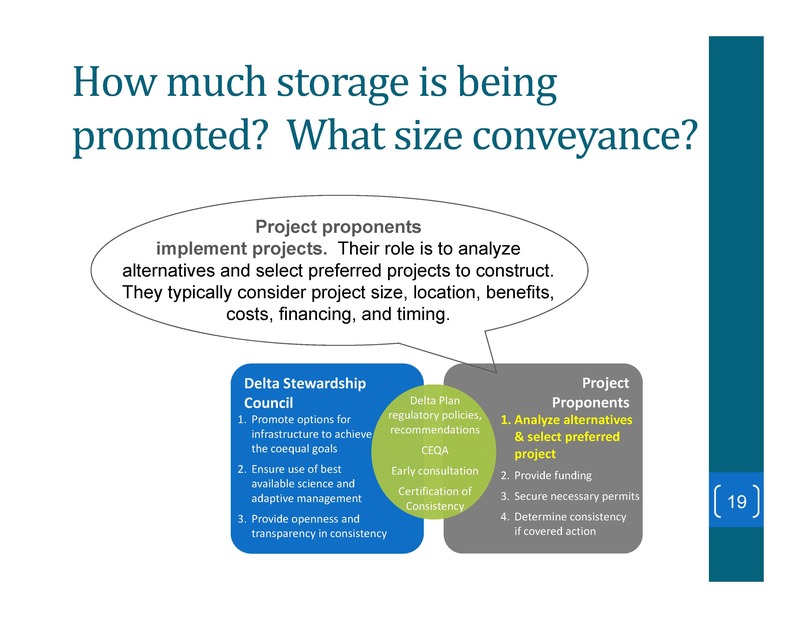 Bethany Pane, Chief Counsel to the Council clarifies that the Delta Plan’s policies would apply to covered actions, but the recommendations would not. “They would just inform project proponents decision making, but they would not apply in the covered actions process,” she said. Councilmember Skip Thomson asked if a recommendation could be that if Water Fix were an alternative, it would be a covered action? 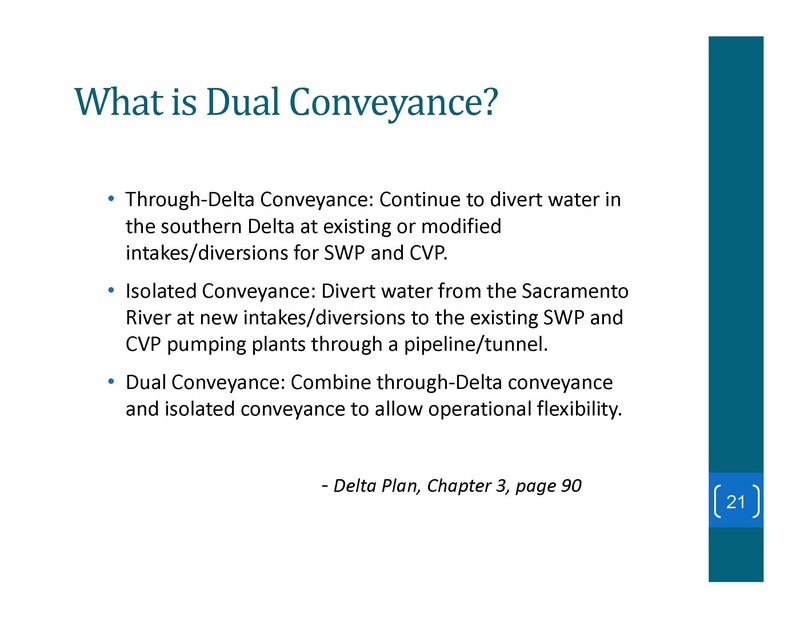 Ms. Enos-Nobriga noted that one of the issues with having the amendment language separated from the Delta Plan is that it’s not connected to the definitions that are in the Delta Plan. 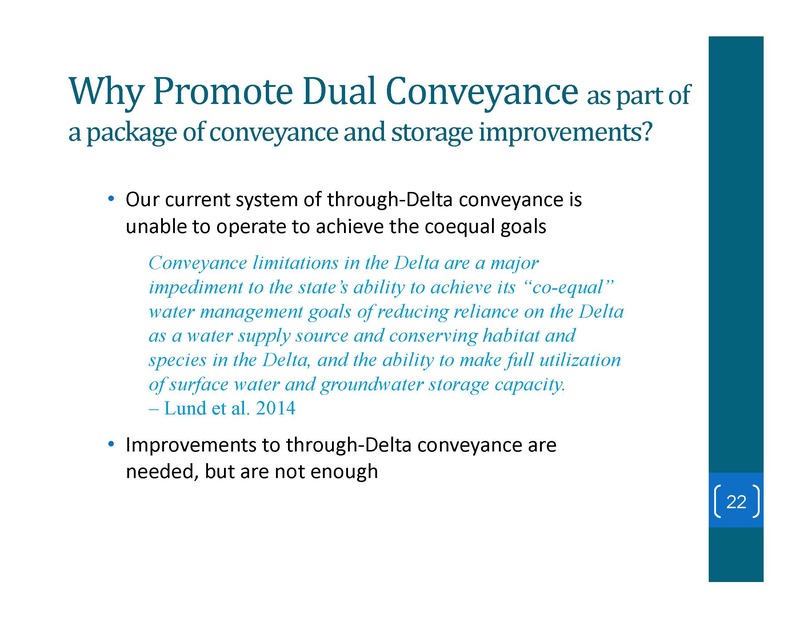 She presented a list of conveyance definitions, noting that the definition of dual conveyance is ‘combining through-Delta conveyance and isolated conveyance to allow operational flexibility.’ “I just want to note that the term dual refers to combination of conveyance mechanisms, not the number of conveyance structures, so the isolated conveyance could have one pipeline or it could have many, depending on the specific engineering design as determined by the project proponent,” she said. Ms. Enos-Nobriga acknowledged that many concerns have been raised related to dual conveyance, concerns related to the effects of water quality as well as concerns related to impacts to communities, agriculture, and recreation. 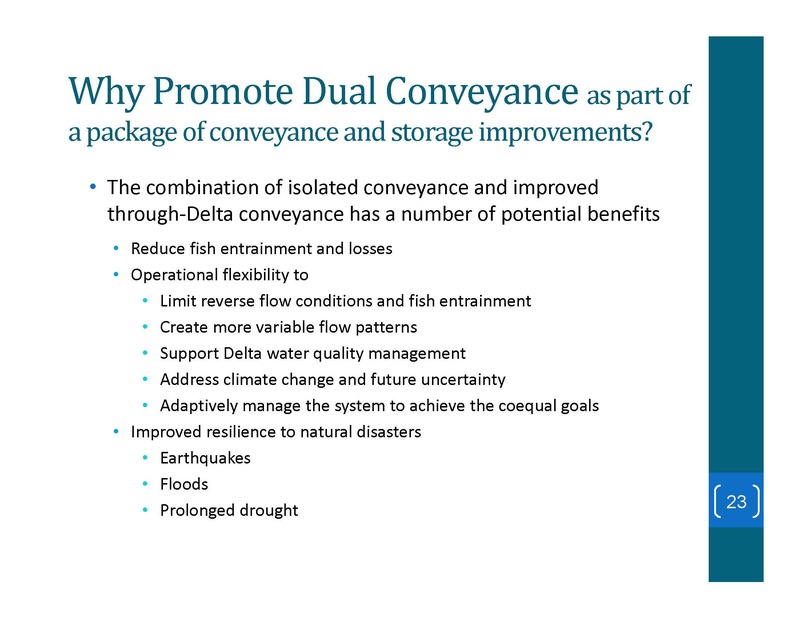 “In addition, we are recommending that integration of storage and conveyance operations should occur at state, regional, and local levels, and that all projects should incorporate adaptive management based on best available science,” she said. Ms. Enos-Nobriga pointed out that all of the concepts in the amendment are supported by best available science and that over 80 references have been added to the amendment in Attachment D. She presented a slide with several quotes. “The point that we’re trying to make is there is a lot of science to back up what is in our amendment,” she said. Chair Fiorini noted that one of the enhancements to the draft has been the scientific citations. 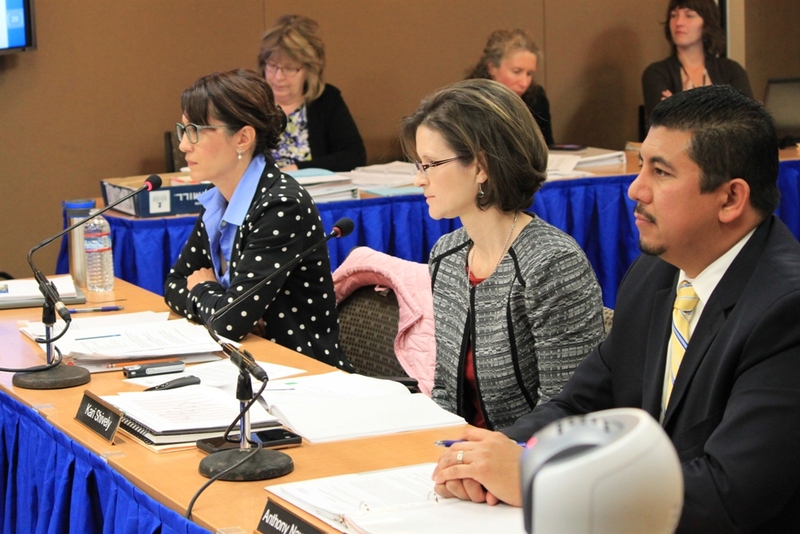 Executive Officer Jessica Pearson noted that the amendment will be submitted to the Independent Science Board for their review and additional comments, questions, or suggestions. 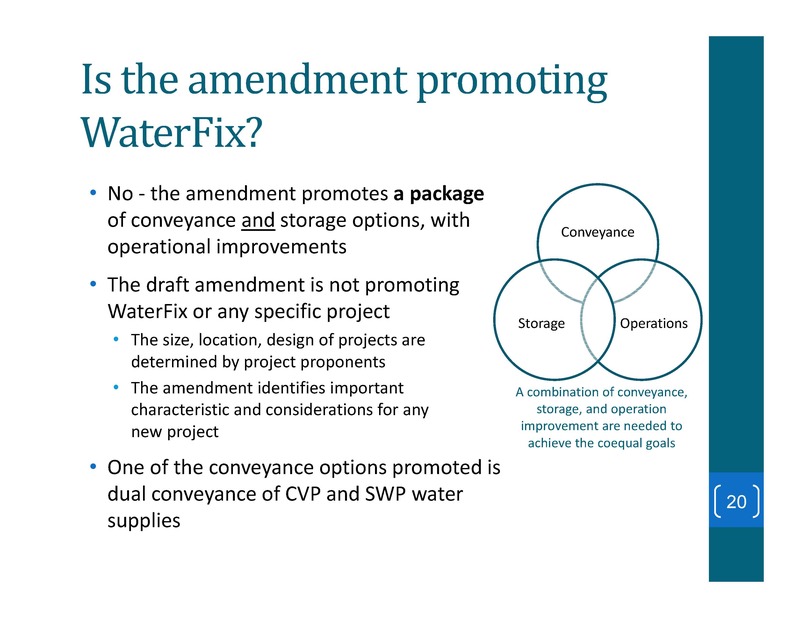 Kari Shively, principal engineer for MWH/Stantec and consultant to the Council for this amendment process then walked through the changes in the amendment, noting that they have received a lot of comments via other meetings and in emails and in comment letters. 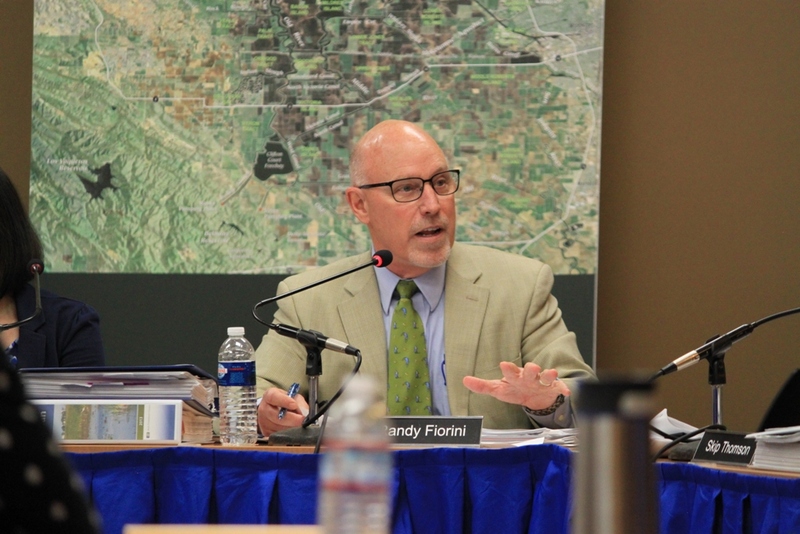 “Today’s discussion draft responds to the comments that we heard in six public meetings,” she said, noting that those include three public workshops held in Tracy, Sacramento, and Diamond Bar; comments at the February and March Council meetings, and at the scoping meeting on March 24th in Sacramento. They have also received and are still receiving numerous comment letters and emails from organizations, agencies, and individuals, so there still are other comments that they are still receiving that are not reflected in the draft they are reviewing today. They received a number of suggestions related to specific text and language that’s included in the draft that we revised, as well as suggestions for a lot of new recommendations, she said. The Council and staff then spent about the next two hours going line by line through the draft amendment language, discussing many issues, including science the science behind the amendment and construction and other impacts to the community. 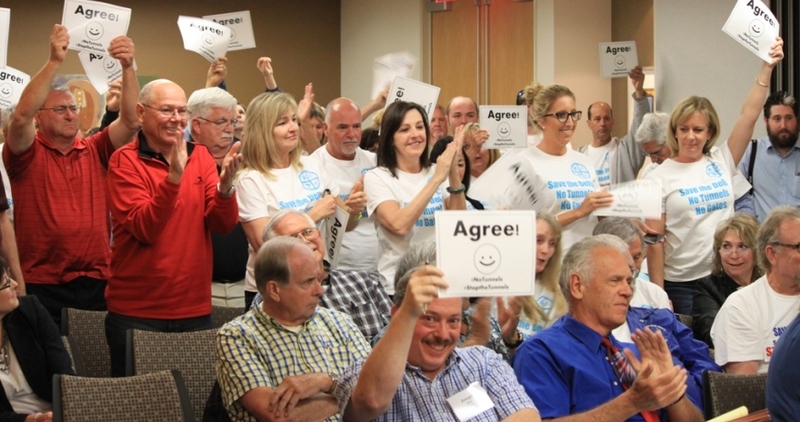 At the conclusion of the Council’s discussion, it was time for public comment. A large number of folks had assembled to address the Council, and even with a time limit of 3 minutes each, public comment lasted over three hours. The commenters were mostly from the Delta; there were a handful from the Bay Area, and a few representatives of elected officials amongst the commenters. 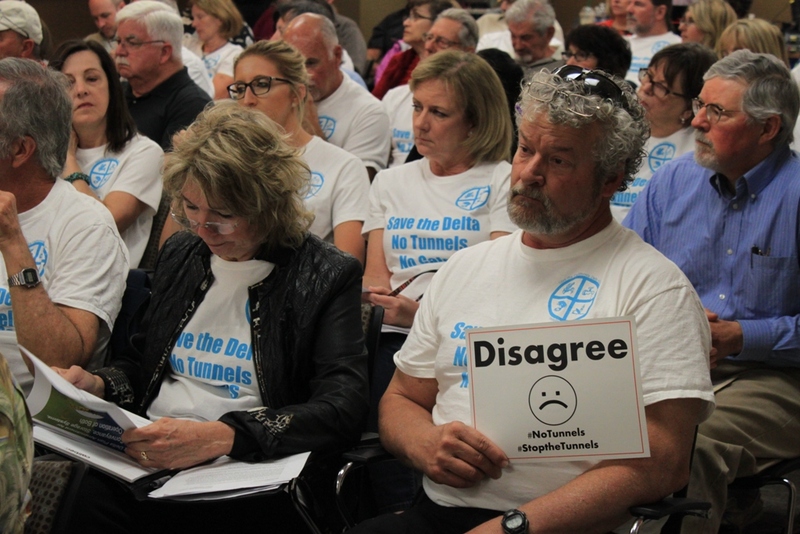 Virtually all commenters spoke in opposition to the tunnels and therefore by extension, in opposition to the proposed amendment. 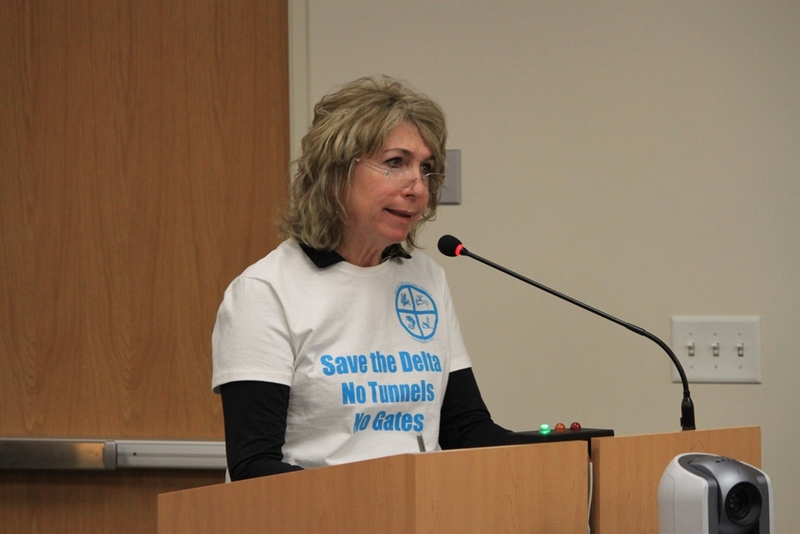 BARBARA BARRIGAN-PARILLA, RESTORE THE DELTA: “Last month, hundreds of informed Delta residents made comments to this Council expressing their robust opposition to the proposed Delta Plan amendment for conveyance and storage that would make Cal Water Fix tunnels the preferred conveyance alternative. While the Council’s workshop on drafting this morning considered some community impacts, it still fails to deal with water quality and quantity impacts that will result as a change in the point of diversion. After public comment had finished, staff then discussed the next steps for the proposed amendment. 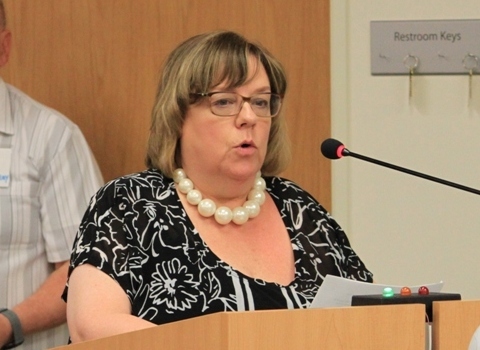 The staff’s intent is to take all the comments heard from the Council and the public at the meeting, summarize those, come back with a draft next month that incorporates responses to the comments. 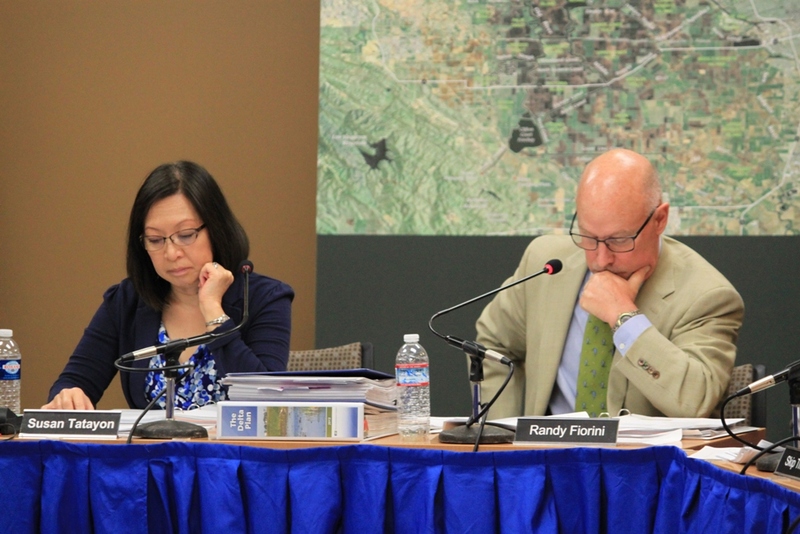 At this point, with the meeting having gone on for nearly six hours without a break for lunch, the Council members were clearly worn out, and most weren’t interested in trying to discuss the amendment further. 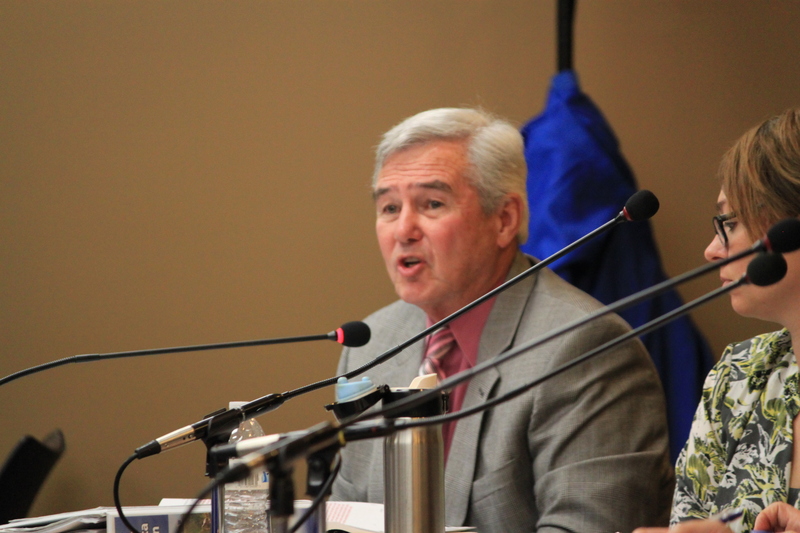 Council member Patrick Johnston suggested they review the changes at the May meeting, but not plan on voting on the amendment at that time. Council member Skip Thomson agreed. For agenda and meeting materials, click here. To watch on webcast, click here.